What is the 2019 French Open? The 2019 French Open is a major tennis tournament that will be held over two weeks between May and June 2019 at the Stade Roland-Garros in Paris, France. One of the four tennis Grand Slams, the French Open is without doubt the premier clay court tennis championship event in the world. The French Open dates back to 1891 and is considered a highlight of the tennis tour. Originally only open to tennis players who were members of French clubs, the ‘Championnat de France’ remained that way 1924. A different tournament called the World Hard Court Championships was contested on clay courts at Stade Français in Saint-Cloud from 1912 to 1914 and in 1920, 1921 and 1923. In 1925 the French Championships was open to international amateurs and held at the Stade Français. The tournament changed drastically when France won the Davis Cup in America in 1927 with the famous quarter of René Lacoste, Jean Borotra, Henri Cochet, and Jacques Brugnon who were known as the ‘Philadelphia Four’. Deciding to defend the Davis Cup at home, the French decided to build a new tennis stadium in the Porte d'Auteuil region of Paris. Three hectares of land was offered by the Stade de France with the Stade de Roland Garros built and names after aviation pioneer and World War I pilot Roland Garros. In 1928 the French Internationals tennis tournament was moved to Roland Garros where it has been held ever since. The tournaments held from 1941-1945 during World War II were not recognised by the French governing body. The French Championships were held after Wimbledon in 1946 and 1947. In 1968 the tournament became the first Grand Slam to become open which allowed amateurs and professionals to compete. Various player awards were introduced in 1981 such as the Prix Orange, the Prix Citron and the Prix Bourgeon. In 2007 the French Open decided to distribute prize money equally for men and women for the first time. Many former top tennis players never won the French Open including Pete Sampras, John McEnroe, John Newcombe, Stefan Edberg, Boris Becker and Venus Williams. On the other hand, some players have dominated at Roland-Garros such as Rafael Nadal, Björn Borg, Ivan Lendl, Justine Henin and Chris Evert. What surface is the 2019 French Open played on? The French open is played on clay courts that produce a different style of tennis when compared to grass courts or hard courts. The ball is slowed down and produces a high bounce which makes it difficult for big servers and serve-and-volleyers. Some players are considered clay court specialists with no better example than Rafael Nadal. 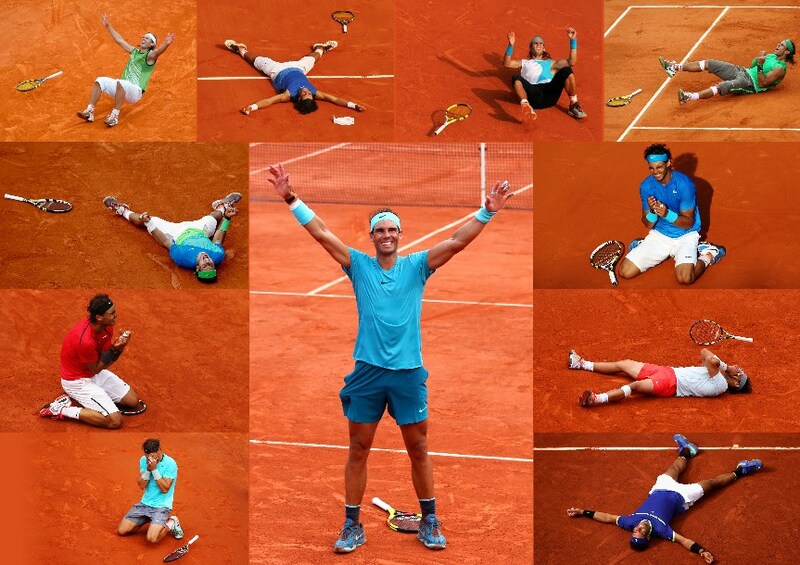 Nadal is virtually unbeatable on clay and has had a stranglehold on the French Open for more than a decade. Where is the 2019 French Open being played? The 2019 Fench Open will be held at Roland Garros which was built in 1928. The Roland Garros complex contains 20 courts with three large-capacity stadiums, France's National Training Centre (CNE) and the Tenniseum which is a multimedia museum of the history of tennis. When does the 2019 French Open start? The 2019 French Open begins on Sunday 26 May 2019 and ends with the Men's Final on Sunday 9 June 2019. Check out the match schedule to endure you don't miss a match at Roland Garros. What are the 2019 French Open Betting Odds? Rafael Nadal leads the betting odds in the men's tournament and it would be a brave tip to back against the record 11 time champion. Novak Djokovic, Dominic Thiem and Alexander Zverev are next best and will hope to upset the Spaniard. Romania's Simona Halep is the favourite to win in 2019 ahead of clay court specialist Garbine Muguruza. Serena Williams, Sloane Stephens and Elina Svitolina are next best in the betting odds for the women's tournament. Who are the favourites to win the 2019 French Open? Rafael Nadal is the clear favourite in the men's tournament ahead of Novak Djokovic and rising stars Dominic Thiem and Alexander Zverev. Simona Halep leads the betting markets in the women's draw in an open betting market. Who has won the most French Open titles? Spain's Rafael Nadal has had a stranglehold over the tournament in recent years, winning 11 of the past 14 French Open men's singles titles. French tennis player Max Decugis won eight titles in the amateru era with Sweden's Björn Borg winning six titles between 1974 and 1981. The United States' Chris Evert is the record women's winner of the French Open having won in 1974, 1975, 1979, 1980, 1983, 1985, and 1986. France's Suzanne Lenglen won six titles in the 1920's with Germany's Steffi Graf winning six French Open titles between 1987 and 1999.
Who are the French Open defending champions? Rafael Nadal is the current men's champion having defeated Dominic Thiem 6-4, 6-3, 6-2 in the 2018 French Open final. Simona Halep is the current French Open women's singles champion after defeating Sloane Stephens 3-6, 6-4, 6-1 in the 2018 final. What is the 2019 French Open Prize Money? The prize money for the 2019 French Open is yet to be determined. It is expected to rise from the €39,197,000 on offer for the 2018 tournament where the men's and women's winners collected €2,200,000 each. Who were the recent French Open Men's Winners and Runners-up? Who were the recent French Open Women's Winners and Runners-up?